Mac Pneumatic Trailers at Kingpin Trailers - Kingpin Trailers LTD. 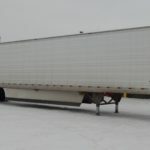 When it comes to the safe transport of powdered cargo like fly ash, cement, concrete, and even food products like flour and grain, pneumatic trailers are often the go-to selection for haulers. Easy to work with, durable, and efficient, these trailers make hauling dry goods simple and reliable. 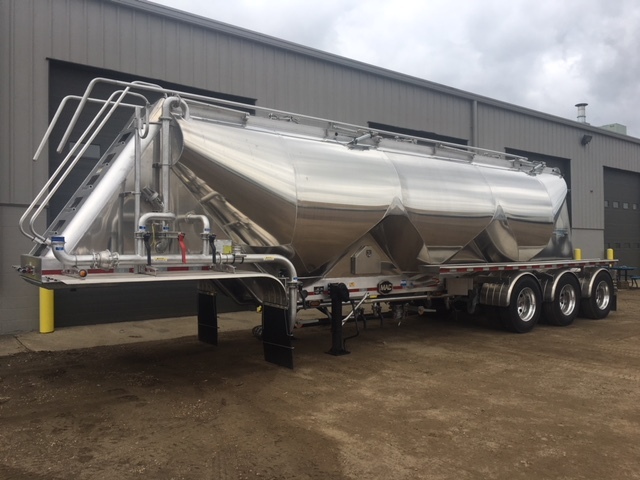 As a leading supplier of the leading trailer manufacturers and products throughout Western Canada, Kingpin is proud to carry a selection of some of the best pneumatic dry bulk trailers on the market. Learn more about pneumatic trailers, as well as our current inventory below. Due to their sturdy design, airtight seal, load capacity, as well as the ease of loading/unloading, dry bulk trailers are one of the most popular options for transporting finely granulated, dry, and other pourable goods. Whether you need to transport materials to a construction site or to haul food products to a processing facility, pneumatic trailers ensure your load is protected from outside air and contamination. Typically constructed of aluminum or steel, dry bulk trailers come in a wide range of sizes with various capacity limits. 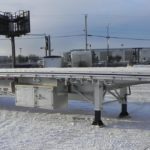 As one of the most popular trailer manufacturers in North America, Mac Trailers has gained a reputation for excellence, particularly with their line of pneumatic dry bulk trailers. Known for producing the lightest models that are capable of hauling the heaviest loads, Mac’s trailers incorporate state of the art design and component that allow for superior fuel economy, ergonomic controls, quick unloading times, and easy maintenance. With an industry leading warranty and a broad network of authorized service providers throughout North America Mac’s trailers pave the way for excellence in hauling and transport. For more information about product availability in Edmonton, Calgary, Vancouver, and Winnipeg, please contact our team directly.